This is an explanation of how negative recessive traits manifest in “pure/inbred” and why they suffer from so many health problems. Before reading this, read my article on hybrid vigor, for a better explanation of basic genetics and terminology. The first thing to understand about negative traits is some are dominant and some are recessive. Basically that means for a dominant trait you only need one copy of the gene from either the mother or the father for the offspring to be affected. For a recessive gene you need two copies of the gene or the gene and one even more recessive than it. This is a simplified explanation because some genes allow other genes in different places on the DNA strand to manifest, and some genes are incomplete dominant and allow recessive traits to show through. Not all recessive traits are negative some are very positive, and have to be selected for, a genes recessiveness alone has no impact on it’s usefulness. What this means in terms of breeding is if a dog has a negative dominant trait it will show and you simply don’t breed that dog to eliminate that trait, this is why most of the negative traits left in dogs are recessive. Negative recessive traits are more complicated because if a dog has a negative recessive gene and the normal dominant version of that gene then they will be normal but will carry the negative trait which may manifest itself in future generations. Negative recessive traits can stay hidden for dozens of generations. The fastest way for negative recessive traits to manifest themselves is to inbreed. Take for example Canine Dwarfism: This is a 10 month old German Shepherd with pituitary dwarfism. Obviously no one would breed this dog. But his parents I’m sure were healthy dogs who simply carried this negative trait. This is how it works. If you breed a carrier to a carrier you get a litter of 25% healthy dogs and 50% carriers and 25% Dwarfs. That’s 25% that get the healthy gene from the dam and the sire and are healthy. 25% that get the healthy gene from the dam and the dwarf gene from the sire making them carriers. 25% that get the healthy gene from the sire and the dwarf gene from the dam making them carriers. And 25% that get the dwarf gene from both the sire and the dam making them dwarfs. If you breed a healthy dog to a carrier you get a litter of 50% healthy dogs and 50% carriers. That’s 50% that get the healthy gene from the dam and the sire and are healthy. 50% that get the healthy gene from the dam and the dwarf gene from the sire making them carriers. In this example the sire is the carrier. If you breed a dwarf to a healthy dog you get a litter of 100% carriers. With the healthy dog passing on healthy genes to 100% of the litter and the dwarf passing dwarf genes to 100% of the litter making them all carriers. If you breed a dwarf to a carrier you get 50% carriers and 50% dwarfs. 50% get the healthy gene from the dam and the dwarf gene from the sire making them carriers. 50% that get the dwarf gene from the sire and the dwarf gene from the dam making them dwarfs. If you breed a dwarf to a dwarf you get 100% dwarfs, with all the dogs getting dwarf genes from both the dam and the sire. This is just an example of one negative trait that some dogs carry most breeds carry many negative recessive traits, and most “purebred” dog carry for something negative. In fact some negative recessive traits are part of the “show standard” which means breeders are intentionally breeding dogs with these traits. You can see my page with pictures of the distortions we’ve inflicted on modern working dogs. 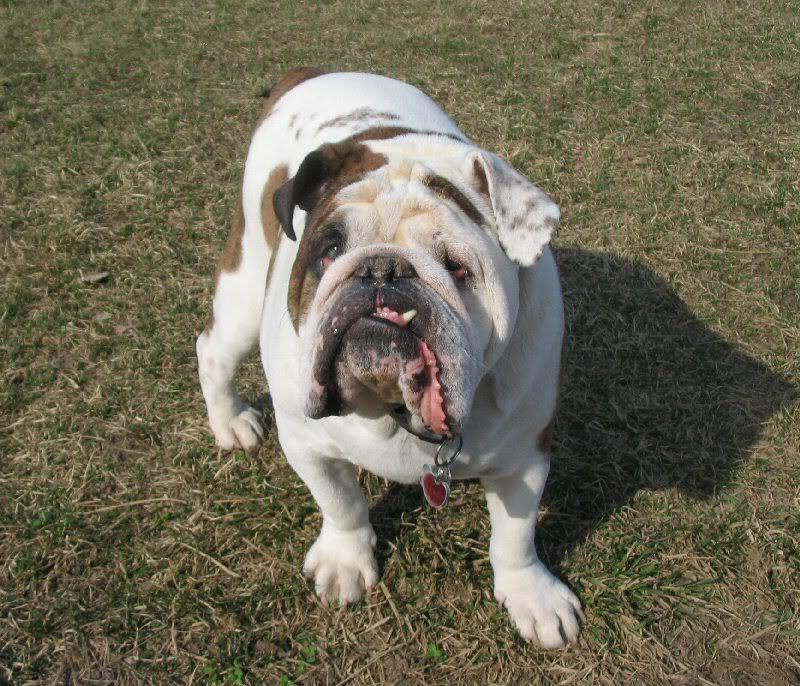 One example is the English Bulldog. This is an English Bulldog. As you can see his nose is so short he can barely breath standing much less running and being active. Something he can barely do because of his toad-like build. Not mention most of these dogs are so twisted out of shape they have to be artificially inseminated, and delivered by C-section. They can’t even breed naturally anymore. Bulldogs were bred to be cattle dogs that were later used in a long outlawed blood sport called bull bating where a dog would fight a bull. This poor dog is a ruined mutant version of the working dogs his forefathers were. This is what the English Bulldog looks like in painting from the 1700 and 1800s. Notice he has legs so he can run and a snout so he can breathe. Luckily these dogs still exist early Americans needed good cattle working dogs and used English Bulldogs. Because these were working dogs they were bred for their working abilities not for how toad-like they could be. These are the American Bulldogs. Notice how much this dog looks like a “pitbull”. That’s because 200 years ago when the “pitbull” was being made, this is the dog they used, not the English Bulldog of the shows of today. 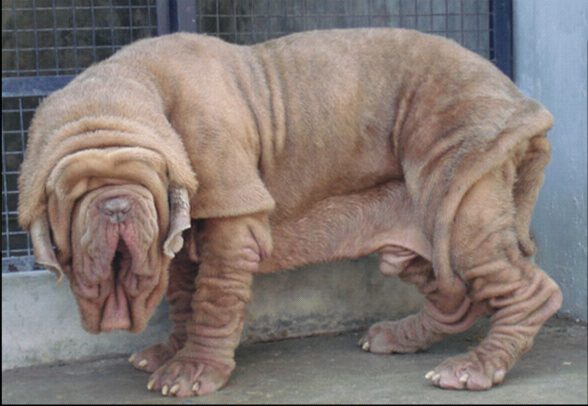 Another example is the Neapolitan Mastiff. This is a 5 year old Neo. This male is the pride of his breeding program. It’s hard to believe anyone would breed such a poor suffering animal in an effort to produce more of them, but they do. With so much loose skin they can’t see, which pulls on the bottoms of their eyes making problems like cherry eye, which requires surgery to allow to dogs to see again. They are consumed by skin infections in the folds and are very sensitive to anesthesia. These dogs were warriors who fought with their masters on the battlefield, but that’s hard to do when your dog is killed by anesthesia trying to get his sight back. This is what the Neo of old looked like. Nothing like the poor dog above him. This brings me to the bandog, a hybrid dog with hybrid vigor working for him, he has the greatest strengths of his ancestors and the flaws of inbreeding removed. this is a Bandog named Cicero he is 27 inches at the shoulder and an awesome specimen. I have one of his sons and he’s one of the greatest dogs I’ve ever had. This dog is 50% Neapolitan Mastiff 25% Great Dane and 25% Pitbull Terrier. His mother was a Neo but notice all the unnecessary flop is gone. This is a dog like the mastiff of old. This is a dog you could take to war. This is a dog named Sosa he died recently and it’s a great shame he was an amazing dog. He was owned by my friend Bruce and is the grandfather of my female Morrigan. Again flawlessly beautiful strong dog with enough aggression to give his life for his family but, intelligent enough to take to Petsmart without a problem. This is Xerxes. 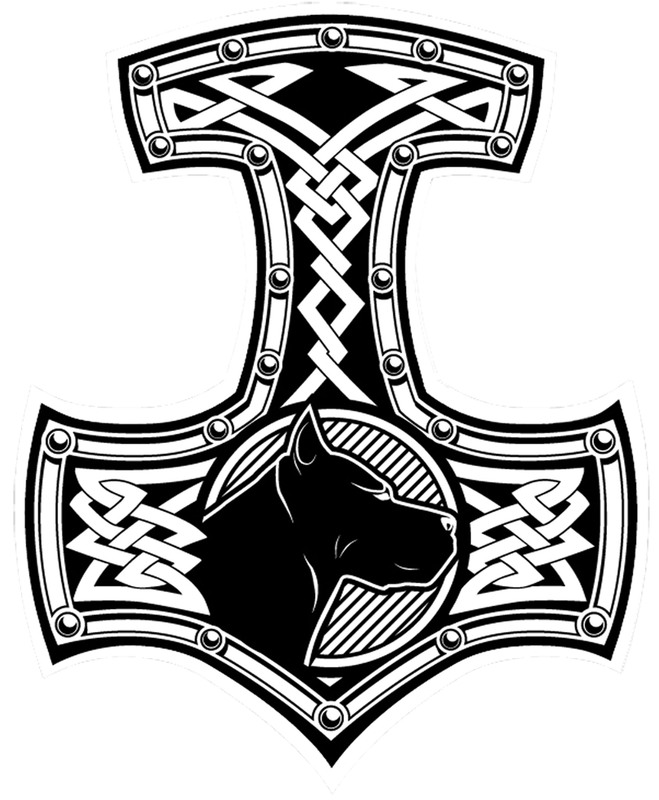 He is the father of Freya, Wendigo and Fenrir. He is also owned by Bruce. Again a beautiful, powerful dog. He’s been known to jump over a standing man, that’s a huge jump for a 140 pound dog. He’s another great example of how hybrid vigor gives dogs back the strength that “pure\show\inbreeding” has taken from them. 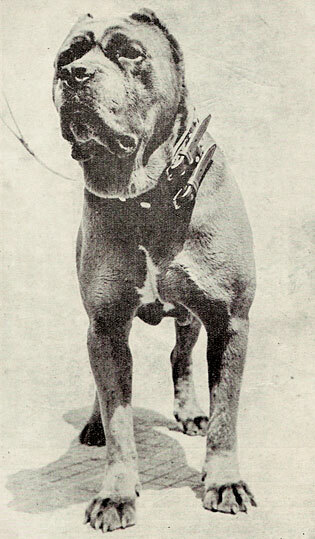 Click here to see painting and photos of working bull and mastiff type dogs from when they actually bred for function.